3 December, 2018 Hi-Lite Electric Inc.
Keeping your children safe and sound is of the utmost importance. While electricity clearly has a plethora of different benefits, it can be dangerous when handled by the wrong people. If the proper precautions aren’t taken, then young children can be at risk of serious injury and even death in some unfortunate cases. 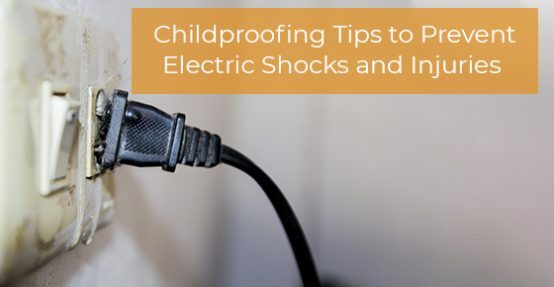 Here, we provide several childproofing tips that can help prevent electric shocks and injuries. Electrical fires often occur due to electronic devices or electrical outlets. In order to childproof these items, you should ensure that your children don’t have access to any electronic appliances that can potentially start a fire in the home. You should also keep an emergency ladder on the second or third floor of your home. The ladder should be kept in a room that is being used by an adult or a responsible older child so they can quickly access and use it properly in the event of a fire. A fire escape plan should also be practiced regularly with your children to reduce the risk of injury during a fire. Scalding hot coffee, burning hot stoves, and even hot faucets can serve as potent hazards when children are concerned. Many children are burned or scalded by hot liquids or other such items because they are not careful. As children are naturally inquisitive creatures, they are especially at risk of being burned. Their sensitive skin makes it even more important that they are protected from items that can scald or burn them. We would recommend that you tamper proof all of your outlets around the house. By installing tamper-proof outlets you will prevent prying fingers from entering into unused outlets. Only a properly rated plug can be inserted into these outlets thanks to an internal barrier. As such, foreign objects and/or fingers cannot enter, which will prevent electrical shock and burns. Unprotected outlets can also be protected via wall plates that are child resistant. They can be placed over conventional receptacles. A spring loaded wall plate will protect unused outlets so that only adults can open them. Plastic outlet caps are yet another option, as they can be added to unused receptacles around the house. They are actually extremely simple to install, so they are recommended if you are not a handy person. They will prevent a toddler’s fingers from contacting unused outlets. Most switch locks will fit over a conventional wall switch. They include handy locking snaps so that children won’t be able to turn appliances or lights on and off. Children can get a good night’s rest by having a nightlight installed in their room. By doing so, they won’t be afraid of the dark and will be more likely to fall asleep. However, it also has the added benefit of allowing them to move around the room without bumping into objects and potentially injuring themselves. Some nightlights have an automatic on/off feature that will turn off at dawn and turn on at dusk. Also, purchase a model that fits over both outlets so that you won’t have to worry about an unused outlet being accessed by your curious child. They are also quite cost effective and energy efficient, as most will only cost you a few pennies per day, and they have many models to choose from, so your child can pick out a model that they love. Also, make sure that every light socket that can be reached by your children has a lightbulb in it. This will help reduce the risk of electrical shock. Extension cords should stay out of your child’s room if possible. If you include extension cords in their room, then they may chew into them and possibly seriously injure themselves or choke on the wire. Or, they may pull on the wire, causing a heavy appliance to fall and cut them or render them unconscious. Batteries must be kept in a safe and secure place where children cannot get a hold of them. Many children die every year because they choke on small batteries, so keep them away from children at all costs. Over 40% of children aged between 11 and 13 are not supervised when they are handling electronic devices. In fact, 1 in 10 children under the age of 7 are also unsupervised when they play with electronic devices. As such, keep a close eye on your children whenever you are home or ask a reliable babysitter to constantly monitor them when they’re playing with certain toys and gadgets. Today, many young children play with electronic games, tablets, phones, and other such devices, so being vigilant will help keep your children safe while they expand their minds and horizons. If you need a licensed electrician in Toronto, then we can help. Hi-Lite Electrical offers repairs, maintenance, troubleshooting, upgrades, home renovations, inspections and safety checks, emergency services, and smoke and carbon monoxide alarms. To learn more about how we can help you keep your family safe from electric shocks, give us a call at 416-800-5536 or contact us here.